This is the strawberry and cream of sorbets – absolutely British and summery. It is very refreshing and the real roses that scent the syrup turn it a bright pink whilst the coconut softens it to more dusky hue. Gently heat 115g Golden Caster Sugar in 600ml water until the sugar had dissolved. Increase the heat and boil for 2 minutes. Remove from the heat and add the petals of 3 Organic Roses, washed, squashing them down with a spoon. Leave to steep overnight in a covered bowl. Strain the mixture through a sieve and discard the petals. Add 1tsp Glycerine, 1 juiced Lemon and 200ml Coconut Milk and stir. Taste and add a bit of Rose Water if needing more rosiness. Churn in an ice-cream maker and then freeze. Since I last posted I have been away in Meribel, France working as a chalet host which was fantastic fun and jolly hard work (I actually got back in May but took a month to recover). Six days a week for four months I started the day with laying out a table bursting with cereals, pastries, fruit, yoghurts and juice and cooking up eggs, bacon and tomatoes to order for 6-9 hungry guests. Once I had cleaned the chalet top to bottom and made the afternoon teacake - laid out just so with a baguette and jams for my rosy-cheeked guests on their return – I was free to whoosh down the mountains myself. In the evening I would could a three-course meal with canapés the evening they arrived and left and tea and coffee after dessert. 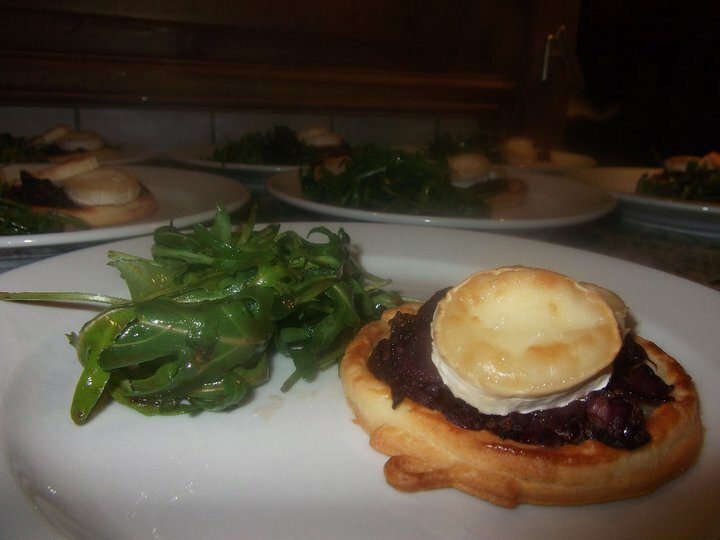 Examples of the food were things like twice baked cheese soufflé or caramelised onions and goats cheese tartlet to start, duck in a redcurrant sauce with sautéed leeks or herb crusted salmon for main and chocolate mousse cake or Brioche Bread and Butter pudding to finish. As I already could cook to a moderate level, I found the recipes simple but a huge amount of prep was needed and timings were so much more important than when I just cooked for family and friends. However, it was a great learning curve and so wonderful when night after night lovely guests would complement the cooking. The skiing day after day wasn’t bad either! So now that I’m back, here are a couple of recipes I recently tried. Being a flower addict I couldn’t resist a packet of salad with edible flowers I saw in M&S and I think they look very pretty against the paleness of the halloumi cheese and bright vinaigrette, albeit not adding much to the taste I’ll admit. The ravioli is incredibly rich and delicious, and I am finally getting the knack of this pasta making malarkey. Pat 1 opened packet of Halloumi Cheese dry with kitchen paper. Slice it into 8 slices, including the ends. Prepare the dressing by whisking the Zest and Juice 1 Lime, 1 Heaped Tbsp Capers, 1 Tbsp White Wine Vinegar, 1 Clove Garlic (finely chopped), 1 Tbsp Wholegrain Mustard, 1 Tbsp Coriander (chopped), 2 Tbsp Olive Oil and a grind of Black Pepper together in a small mixing bowl. Heat 2 Tbsp Olive Oil in a frying pan over a medium heat. When the oil is really hot, press each slice of cheese into Seasoned Flour to coat it on both sides, then add them to the hot pan as they are done. Cook for 1 minute on each side, or until golden. Serve them straight away on warmed plates with the dressing poured over and garnished with a few Edible Flowers. This is good served with lightly toasted pitta bread or Greek bread with toasted sesame seeds. · Place 150g Tipo 00 Flour, 50g Fine Semolina, 1 Large Egg and 3 Large Egg Yolks in a food processor and pulse until they form a yellow ball of dough. The dough should be firm, not sticky, like plasticine. Wrap in cling film to stop drying out whilst you make the filling. · Soak 50g Porcini Mushrooms in 100ml hot water for 10 mins. · Heat 3 Tbsp Olive Oil in a frying pan and add 1 Garlic Clove, finely chopped, and cook gently until softened. Add 250g Portobello Mushrooms, sliced 1cm thick, and 1 Tsp Chopped Thyme and cook for 15mins, until all the liquid from the mushrooms has evaporated. · Drain the porcini, reserving the liquid, then add the porcini and half the water to the pan. Cook until the liquid has evaporated again. Remove from the heat and cool. · Finely chop the mushrooms and add to 200g Ricotta Cheese and 75g Grated Parmesan. Mix and season. · Roll out the pasta as thinly as possible, following your pasta machine instructions. Place 1 Heaped Tsp of filling at 3cm intervals along the bottom half of the sheet (I find it easier to cut the sheets into sections). Brush water around each filling and fold the top half over the filling, pressing down with the side of your hand to encase it tightly (make sure there are no air pockets). Cut each ravioli neatly with a knife or use a pastry cutter. · Cook the ravioli in a large pan of boiling salted water for 3-5 minutes, until al dente. Meanwhile soften 75g Unsalted Butter in a frying pan with 6 Sage Leaves. Drain the ravioli and toss with the butter. Serve with asparagus, black pepper and grated Parmesan.